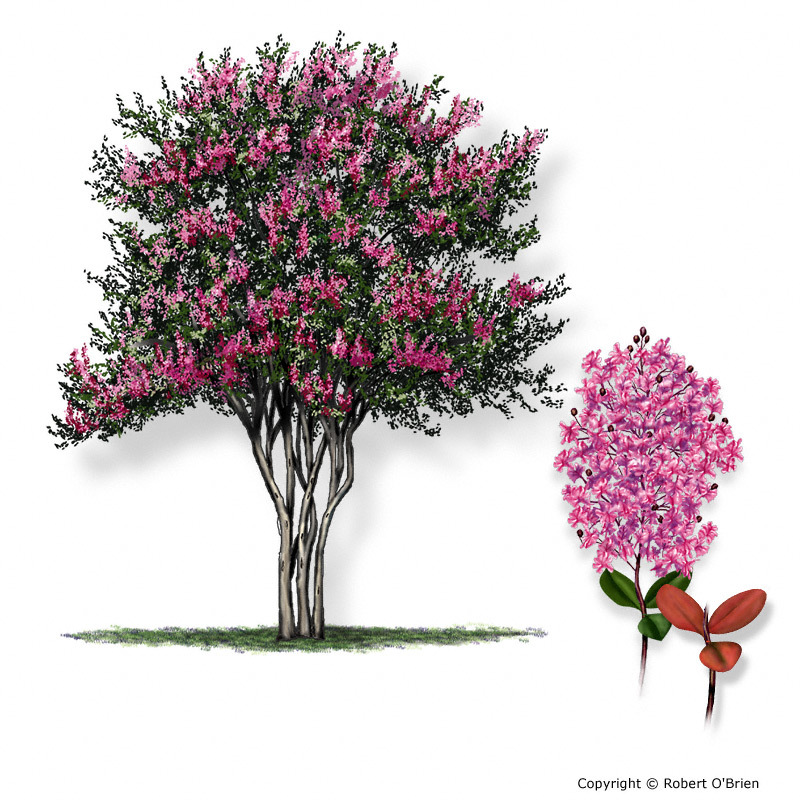 Perhaps the most common small landscape tree or large shrub planted in Texas, crapemyrtle is usually multi-trunked with smooth, muscular limbs, grows to 20 feet tall and 15 feet wide, with mature trunks ranging from 4" to 12" in diameter. Native to China and Korea, it performs well as a landscape tree across most of Texas. It tolerates a wide range of site conditions, including drought and slightly alkaline soils. Simple, alternate, 1.5" to 3" long, oval to oblong, thin, blunt-tipped, without teeth along leaf edge. Some cultivars turn red or orange in the fall. Showy spikes of white, pink, red, or purple flowers appear throughout the summer, each made up of petals that resemble crepe-paper. Not fragrant. An upright spike of round 0.5" diameter green fruits develops in late summer, drying to brown spherical capsules that open to release the winged seeds up to 0.25" long. Smooth, muscular, in irregular patches ranging from tan to chocolate-colored, peeling during the growing season into long, thin strips that fall away to reveal new bark beneath. Hard, dense, light-colored; no commercial uses. Major economic value is in the nursery trade; many cultivars are available, with selections from the National Arboretum the most pest-resistant. Queen's crapemyrtle (Lagerstroemia speciosa) and Japanese crapemyrtle (L. fauriei) are similar, but have opposite leaves. A common - but incorrect - pruning practice of removing the entire top of the tree each winter is called "crape murder."